← Rapid increase in ocean heat…? 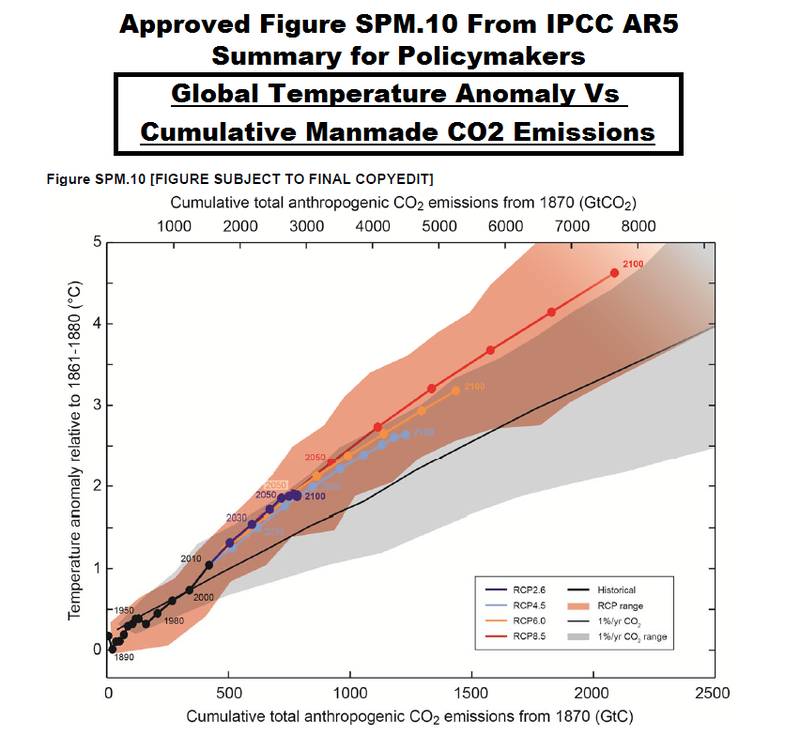 The IPCC saved the most misleading graph in their approved final version of the AR5 Summary for Policymakers for last. It’s their Figure SPM.10, included here as my Figure 1. It presents global surface temperature anomalies as a function of cumulative manmade carbon dioxide emissions. That’s as far as anyone needs to read. The illustration is based on climate models. Climate models are so far removed from reality that they cannot be used to attribute global warming to natural processes or to human-induced factors and cannot be used for predictions of future climate based on projections of manmade greenhouse gases. Climate scientists/modelers have only proven they are capable of creating complex numerical models and that they are able to tune those models to roughly approximate the rate of warming during the last warming period that started in the mid-1970s and ended about the turn of the century, but only during that period. Further, even the rates of numerical warming created within the models during that last warming period are flawed. NOTE: Much of this post is background information. 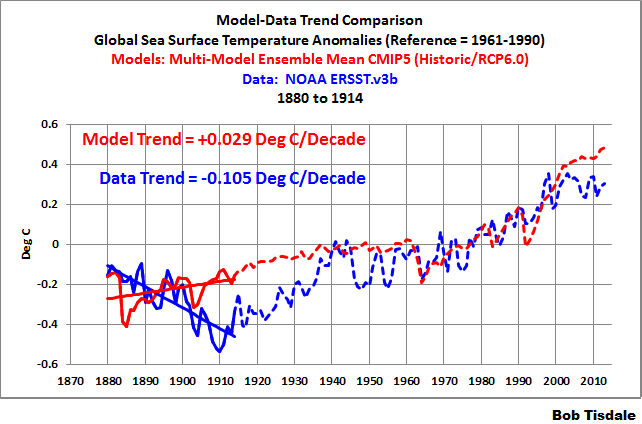 It shows how poorly the climate models simulated global sea surface temperatures since 1880. If you’re not interested in how, where and why climate models are not capable of simulating the surface temperatures for about 70% of the planet, then please scroll forward to the heading of CLIMATE MODELS DO NOT SUPPORT THE HYPOTHESIS OF HUMAN-INDUCED GLOBAL WARMING after Figure 15. We compared data and climate model outputs of global surface temperatures (land and ocean) since 1880 in the post Model-Data Comparison with Trend Maps: CMIP5 (IPCC AR5) Models vs New GISS Land-Ocean Temperature Index. For my book Climate Models Fail, I revised the breakpoints in the comparisons to 1914, 1945 and 1975 (instead of 1917, 1944 and 1976). The breakpoints of 1914 and 1945 were determined by Dr. Leif Svalgaard. See his April 20, 2013 at 2:20 pm and April 20, 2013 at 4:21 pm comments on the WattsUpWithThat cross post. And for 1975, I referred to statistician Tamino. Using those breakpoints will hopefully avoid the claims of cherry-picking. In this post, we’ll be looking at global sea surface temperature anomalies starting in 1880 and ending in year-to-date (YTD) 2013. The dataset is ERSST.v3b—which is used by GISS in their Land-Ocean Temperature Index—for consistency with the previous post and with Climate Models Fail. The models are the multi-model ensemble mean of the simulations of sea surface temperatures for the CMIP5 (IPCC AR5) models, using the historic and RCP6.0 scenarios. (See the post On the Use of the Multi-Model Mean.) We’ll break the data and models down into the two warming periods and two cooling/reduced warming periods using the same breakpoints of 1914, 1945 and 1975. 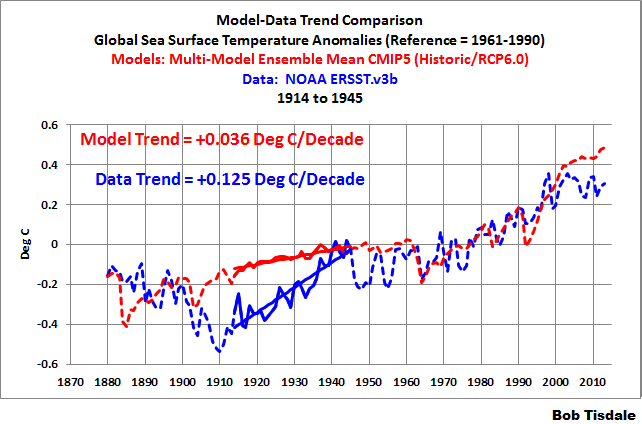 Because global land-plus-sea surface temperature data and sea surface temperature data don’t have the same breakpoints, 1914, 1945 and 1975 will look at little odd. Refer to Figure 2. Yes, the models perform that poorly. The linear trends are as calculated by EXCEL. Let’s start with the period when models performed best, and then work out way back in time. 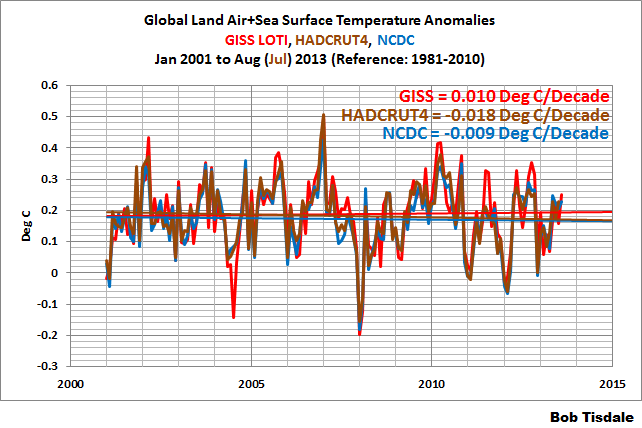 Global (land+sea) surface temperatures stopped warming in 2001. (See the post here.) 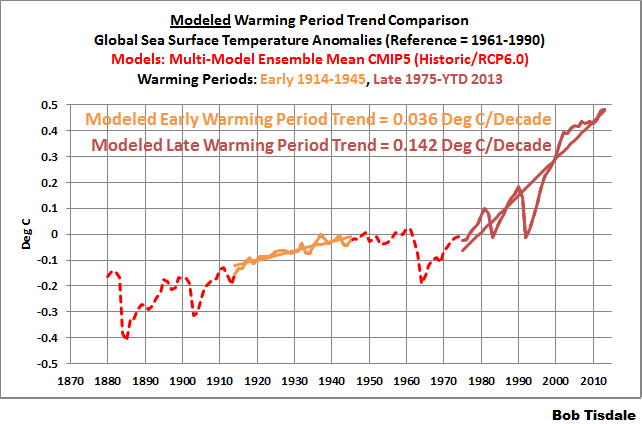 Even so, the models show the warming continuing to present times. So we’ll use (year-to-date) 2013 as the end year for the recent warming period. As shown in Figure 3, the modeled warming rate of global sea surface temperatures is about 40% higher than the observed trend during the period of 1975 to (YTD) 2013. Keep in mind the models had been tuned to the observed surface temperatures during much of this period. The patterns in time and the spatial patterns of sea surface temperature warming (or cooling) contribute to when and where land surface temperatures vary. Therefore, based on the models’ failures to simulate sea surface temperatures properly, it is unlikely that they can properly simulate land surface air temperature anomalies. Note: For further information about the Atlantic Multidecadal Oscillation, see NOAA’s AOML (Atlantic Oceanographic and Meteorological Laboratory) Frequently Asked Questions webpage here, and my blog post here and my introduction to the Atlantic Multidecadal Oscillation here. In Figure 5, the warming and cooling rates are shown on a zonal mean basis. The variable for the zonal mean graphs in this post are the trends in deg C/decade and it is shown in the (vertical) y-axis. The (horizontal) x-axis is latitude, so the South Pole is (at -90) on the left, the North Pole is (at 90) on the right, and the equator is at zero deg latitude. 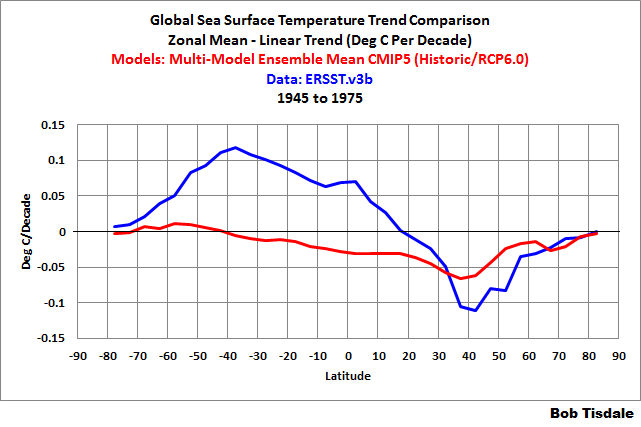 Basically, the zonal mean graphs in this post present the warming (and cooling) rates of sea surface temperatures at the different latitudes. show no similarity to the warming and cooling rates in the surface temperatures of the Southern Hemisphere oceans south of about 35S. That poor performance makes one wonder how the modelers could ever hope to attempt to simulate land surface air temperatures. Figures 3, 4 and 5 showed how poorly the latest generation of climate models (CMIP5) simulated the warming (and cooling) of global sea surface temperatures during the recent warming period of 1975 to (YTD) 2013 — a period to which they are “tuned”. The models are not going to show improvement as we look at the earlier periods. 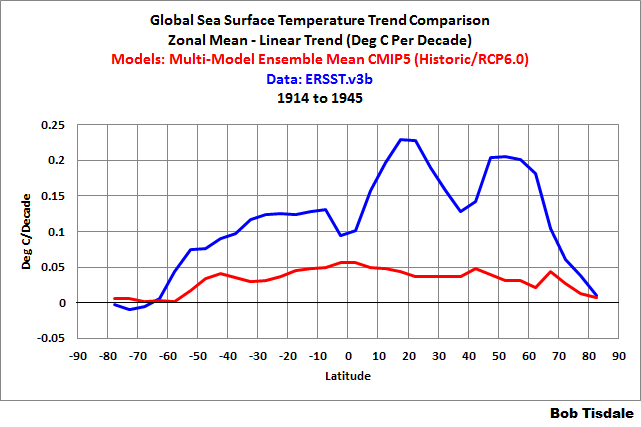 According to the ERSST.v3b data, Figure 6, sea surface temperatures warmed at a reduced rate from 1945 to 1975. (Also see the discussion of HADSST3 data following Figure 8.) The models estimated cooling during this period, basically a response to the eruption of Mount Agung in 1963-64.
the warming of sea surface temperatures in the entire Southern Hemisphere. This is further illustrated by the warming and cooling rates when the data and model outputs are presented on a zonal mean basis, Figure 8. 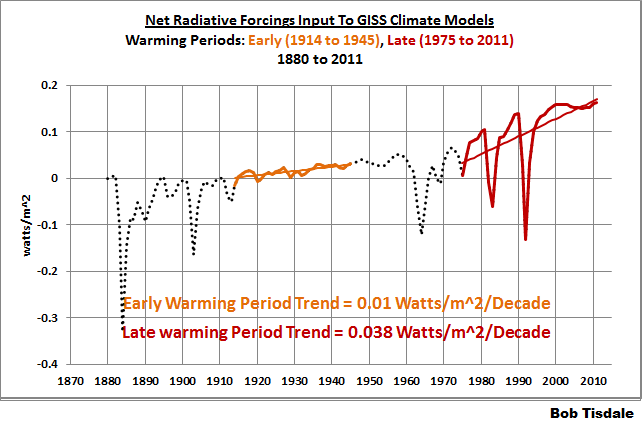 The most obvious model failing occurs during the early 20th Century warming period of 1914-1945. It stood out like a sore thumb in Figure 2, and it looks no better in Figure 10. Global sea surface temperature anomalies warmed at a rate of 0.125 deg C/decade, but the models indicated that they should only have warmed at a rate of 0.036 deg C/decade IF sea surfaces were warmed by manmade greenhouse gases, including carbon dioxide. 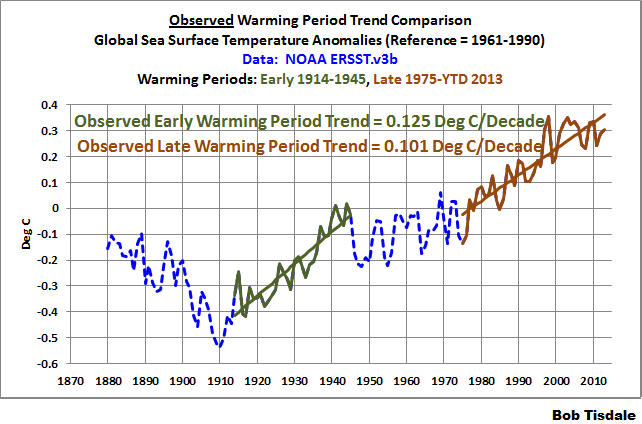 The observed warming was about 3.5 times greater than the modeled warming. That additional observed warming, therefore, has to result from natural variability — it can’t be explained by the assumed impacts of anthropogenic warming shown by the models. And that’s a gigantic problem for hypothesis of human-induced global warming, which we’ll discuss later in this post. 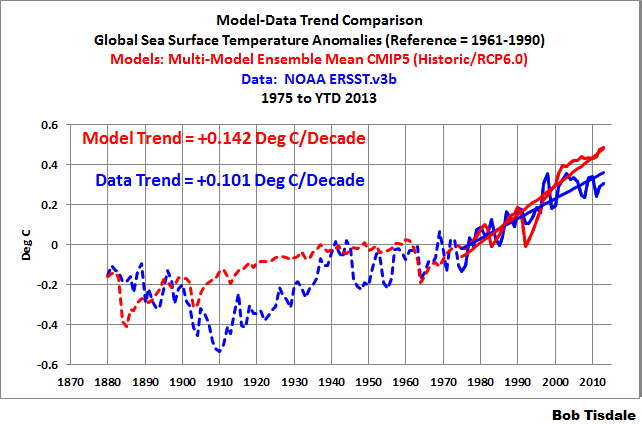 Looking at the trend maps, Figure 11, there’s no reason to go into any great detail about where the models failed. They failed to capture the warming just about everywhere. How pathetic is that! 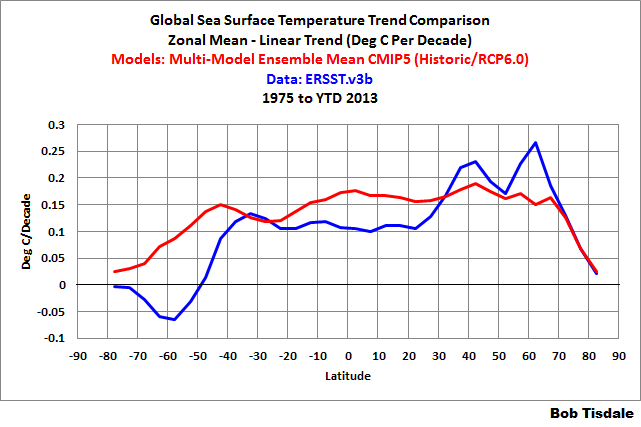 And as shown in Figure 12, the failings are further confirmed by the trends on zonal mean (latitude average) basis. 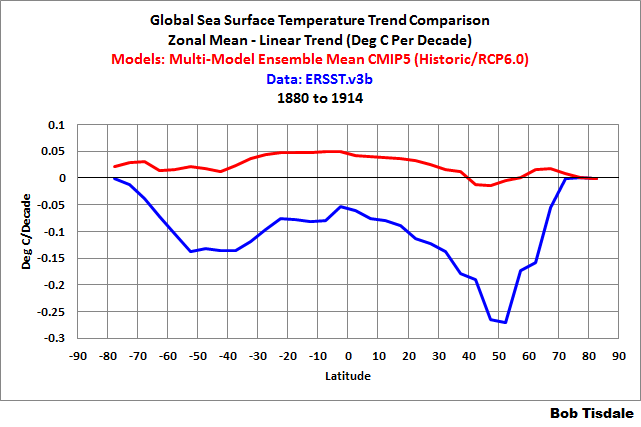 The models used by the IPCC for their 5th Assessment Report indicate global sea surface temperatures should have warmed at a rate of about 0.03 deg C per decade from 1880 to 1914, Figure 13, but according to NOAA’s ERSST.v3b data (used by GISS for their Land-Ocean Temperature Index) sea surface temperatures cooled at a strong rate of more than -0.1 deg C/decade. The models missed their mark by about 0.13 deg C/decade during this early cooling period. 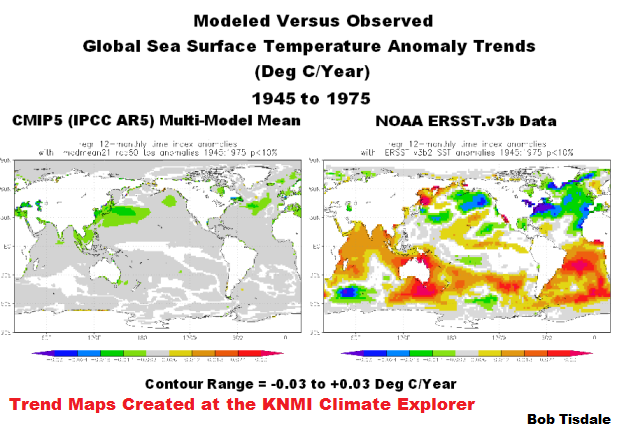 The trend maps in Figure 14 and the modeled and observed trends on a zonal mean basis, Figure 15, show how poorly the models simulated sea surface temperatures during this period. Much of the post to this point was background information for this portion. Recall that in Figure 1, the IPCC presented their climate model-based assumptions that (1) global surface temperatures warmed in response to accumulated manmade carbon dioxide emissions from 1850 to present and (2) that global surface temperatures would continue to warm into the future based on climate model projections. The virtual sea surface temperatures in climate models are forced to warm primarily by the assumed impacts of well-mixed anthropogenic greenhouse gases, with carbon dioxide the dominant manmade greenhouse gas. 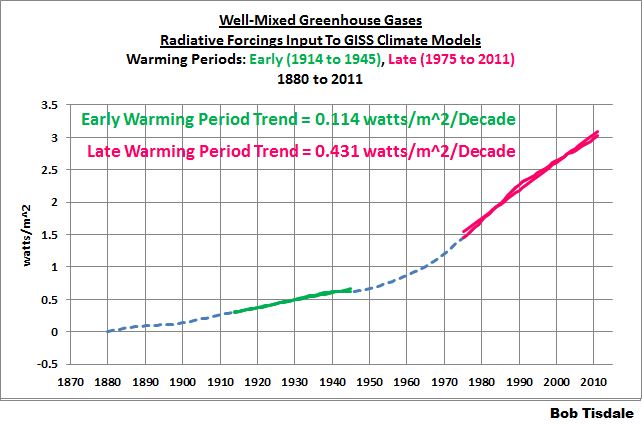 (See Figure 16) For example, according to the forcings used by GISS in their climate models, the climate forcings associated with well-mixed greenhouse gases increased at a rate that was about 3.8 times faster during the later warming period of 1975 to 2011 than during the early warming period of 1914 to 1945. Climate modelers then suppress the hypothetical warming in the climate models with other manufactured climate forcing datasets. (See Figure 17) Using the GISS forcings again, however, we can see that the Net Forcings still show the higher rate of increase during the later warming period, and that it’s still about 3.8 times faster during the later warming period of 1975-2011 than during the early warming period. 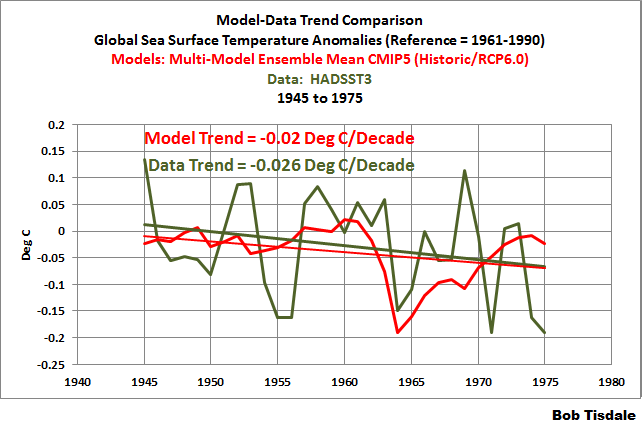 Bottom line for the models: according the forcings used as inputs and according to the multi-model ensemble member mean output of the latest and greatest (CMIP5) generation of climate models, global sea surface temperatures during the later warming period (1975 to YTD 2013) should have warmed almost 4 times faster than they did during the early warming period (1914 to 1945). But, unfortunately for the models, Figure 19, the actual observed warming rate during the later warming period was less than during the early warming period. That is, the sea surface temperatures warmed about 25% faster during the early warming period than during the late warming period. 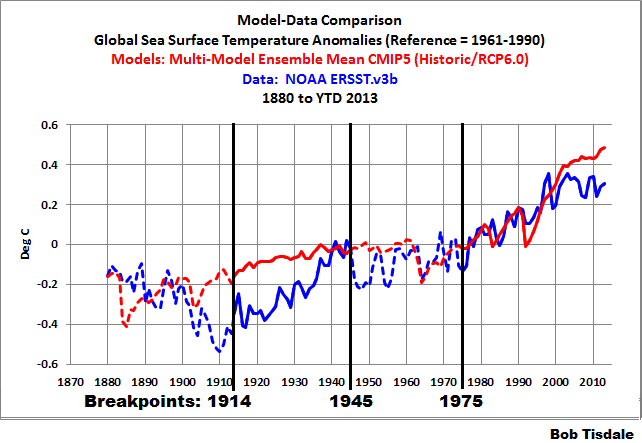 Granted, during the last 12 years of the late warming period, global sea surface temperatures have not warmed. We could eliminate the data for the current hiatus period (2002 to 2013 for example) and show the warming during the abridged late warming period (1975 to 2001) was comparable to the trend during the early period. But, that still doesn’t help the models. Note: The following is the Summary of Chapter 4.4 from Climate Models Fail. Though Chapter 4.4 presented the combined global (land+ocean) surface temperatures, the conclusion of that chapter also applies to this post. The fact that the models simulated the warming better during the more recent warming period does not mean that manmade greenhouse gases caused that warming — it simply reveals that the modelers managed to tune their models to perform better for the more recent warming period. The climate models cannot simulate the observed rate of warming during the early warming period (1914-1945), which warmed at about the same rate as the recent warming period (1975-2012). This illustrates that global surface temperatures can warm without being forced — unlike climate models which must be driven by the natural and anthropogenic forcings used as inputs. And the similarities between the observed warming rates during the early and late warming periods indicate that the much higher anthropogenic forcings during the late warming period had little impact on the rate at which observed temperatures warmed. In other words, the climate models and data do not support the hypothesis of anthropogenic forcing-driven global warming; they contradict it. The world portrayed by all those number-crunching climate models is a fantasy world — with little or no relationship to the real world. For more than 4 years, I have presented how, once ocean heat content data and satellite-era sea surface temperature data are broken down into logical subsets, they no longer support the hypothesis of human-induced global warming. That is, the NODC’s ocean heat content data for the depths of 0-700 meters and NOAA’s satellite-enhanced (Reynolds OI.v2) sea surface temperature data indicate that the oceans warmed in response to naturally occurring, sunlight-fueled, coupled ocean-atmosphere processes—not via manmade greenhouse gases. If this subject is new to you, refer to my illustrated essay “The Global Warming Challenge” (42MB pdf). The natural warming of the global oceans was also the subject of two YouTube videos — for those who would like to listen and watch me explain how that happens. I prepared those well-illustrated videos for the WUWT-TV special last year. Part 1 is here and Part 2 is here. I referred to my latest book Climate Models Fail a number of times in this post. Climate models Fail is a collection of model-data comparisons, and it includes a chapter about research papers that are very critical of climate model performance. In addition, I also present the natural warming of the oceans in Section 9. See the Table of Contents in the Free Preview to Climate Models Fail. About 60 pages of the 350-page pdf edition, including 40 illustrations, pertain to this topic. (Climate Models Fail is also available in Kindle format, through Amazon.) While the subject matter (natural warming of the global oceans) is the same as past presentations, in Climate Models Fail, I presented the discussion in a different order, which will hopefully make it easier to understand. Climate Models Fail was also edited by someone without a technical background so it is definitely easier to read. And of course there is much more detail in my book Who Turned on the Heat? — The Unsuspected Global Warming Culprit: El Niño-Southern Oscillation. 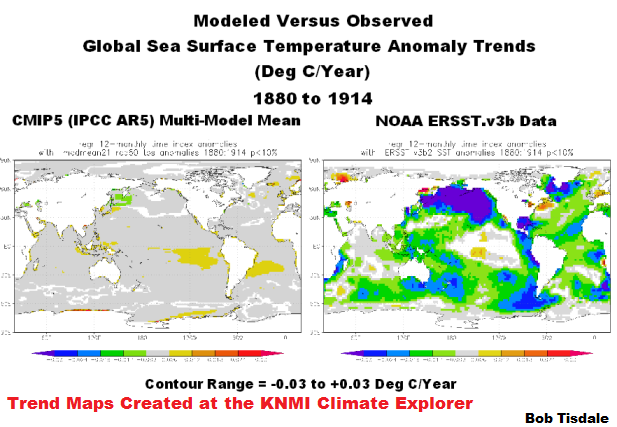 Figure 20 illustrates the observed annual global sea surface temperature anomalies from 1880 to (YTD) 2013. 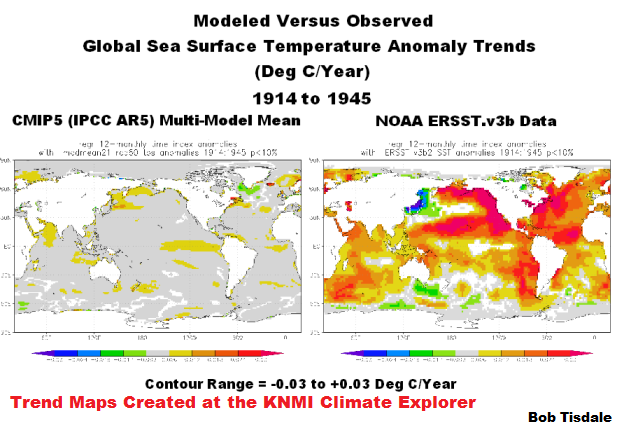 Also shown is the difference between the modeled and observed global sea surface temperature anomalies, with the data subtracted from the mean of the model outputs. I’ve changed the base years for anomalies to the full period of the data (1880 to 2012) so that the base years did not influence the difference. Somehow, the climate science community, under the direction of the IPCC, would like the public and policymakers to believe that their climate models are realistic representations of climate. Global sea surface temperatures warmed faster during the early 20th Century warming period of 1914 to 1945 than during the recent warming period of 1975 to (YTD) 2013. On the other hand, the climate models used by the IPCC for their 5th Assessment Report indicate something else entirely. 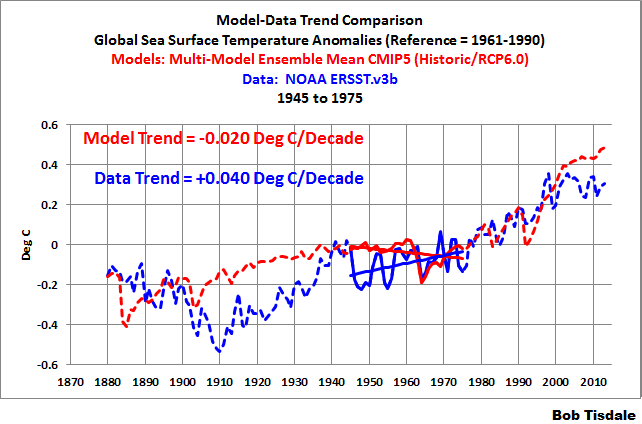 The models indicate sea surface temperatures should have warmed almost 4 times faster from 1975 to present than they did from 1914 to 1945. Clearly, the climate models used by the IPCC cannot be employed to attribute global warming to manmade greenhouse gases like carbon dioxide, and they definitely cannot be used to forecast climate over any time period based on projections of future manmade greenhouse gas emissions. Yet, the climate scientists who prepared the 5th Assessment Report for the IPCC create illustrations like their SPM.10 (my Figure 1), which amusingly use climate models as “proof” that past global warming was caused by carbon dioxide emissions and that global temperatures will continue to warm in response to future CO2 emissions. The climate scientists’ unwavering belief that carbon dioxide drives global warming, despite the climate models clearly showing otherwise, is evidence of their delusions about CO2 or their need to misrepresent their models (for any number of reasons). Personally, I think it’s a combination of the two. 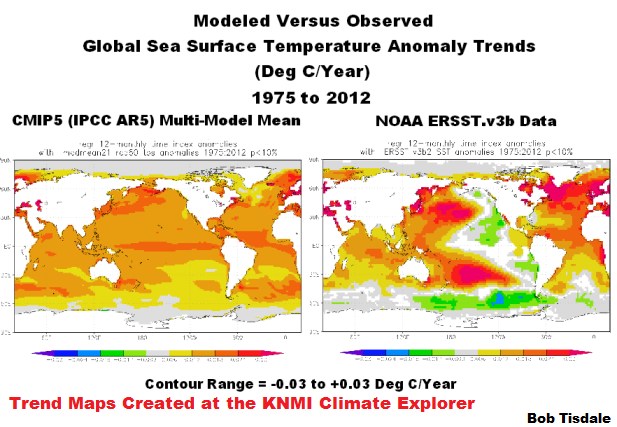 The model outputs and data, including the trend maps, are available through the KNMI Climate Explorer. This post is available here in pdf format for those readers who would like to file it as a supplement to Climate Models Fail. This entry was posted in Essays & Books, Model-Data Comparison SST. Bookmark the permalink. It might be useful to show the 1951-2012 period as well, including trend maps and zonal means etc. Marcel Crok: I’ll take a look, but I’ve clearly shown in this post that there are major errors over multidecadal time spans, not simply 15 years. Pingback: Will their Failure to Properly Simulate Multidecadal Variations In Surface Temperatures Be the Downfall of the IPCC? | Watts Up With That? Bob: Do you or did you have relatives in or from Dunkirk, New York. I’m originally from Dunkirk and peddled papers with a Bob Tisdale in Dunkirk from 1939 – 1942, after which I went off to war & haven’t been back there very much since then. 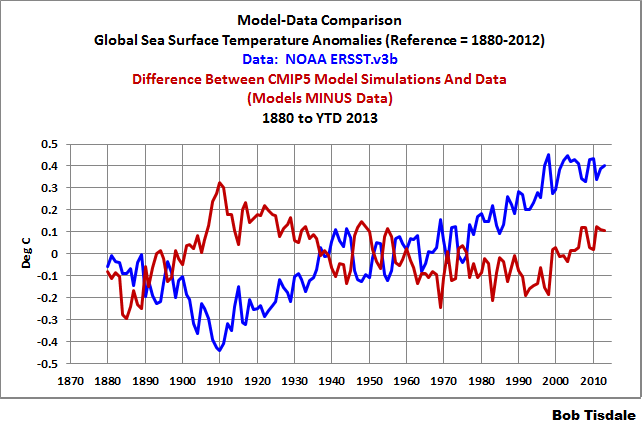 Pingback: The 2014/15 El Niño – Part 5 – The Relationship Between the PDO and ENSO | Watts Up With That? Pingback: With ARGO, There is a Wide Range Warming (and Cooling) Rates of the Oceans to Depths of 2000 Meters | Watts Up With That? Pingback: Climate Propaganda from the Australian Academy of Science | Watts Up With That?